When it comes to finding a dog bed, you’ll first need to find a model that will keep your dog comfortable. However, it’s also important to find one that shows off their personality and looks great in your home. We’ve found 10 of the best and cutest dog beds available on Amazon to improve your pet’s sleeping habits and overall comfort. 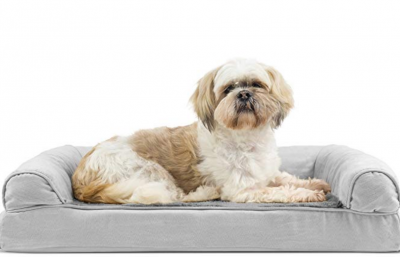 There are six different colors that the FurHaven Orthopedia Dog Bed is available in ranging from beige to a dark and stormy grey. It has a three-bolster design that is meant to give your pet an ample amount of flexibility no matter how they sleep. There is also more than enough headspace for them to get as cozy as possible as well as open corners for nuzzling. The exterior fabric of the bed is crafted out of faux fur that is incredibly plush, soft, and gentle on their paws and nose. Your dogs will surely appreciate how comfortable the bed is after using it for the first time. The most important feature is the orthopedic foam base. It is specifically designed to soothe any painful pressure points and joints for a more comfortable sleep. 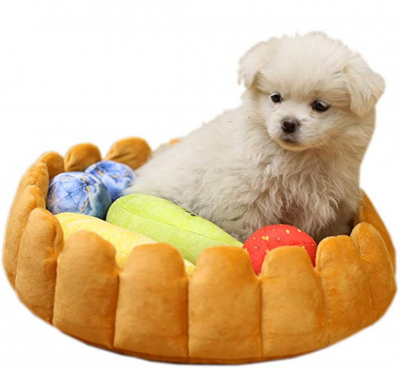 The Friends Forever Donut Dog Bed is highly recommended for small to medium dogs as well as cats. You can choose from two different sizes as well as two different colors. It features a raised rim that makes it easier for dogs to cuddle with an outstanding sense of security. You’ll also love the comfortable fill added to the bed that provides support for their head and neck. Additionally, it may help with arthritic pain in older dogs. 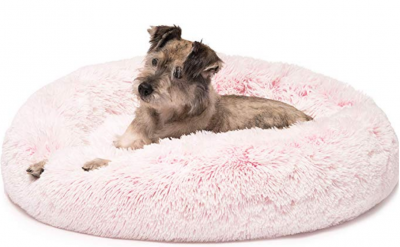 As for the exterior material, the Friends Forever Donut Dog Bed features a synthetic plush fur cover that is equally as comfortable as it is breathable. We also love how the bed is made out of non-toxic materials and the cover can be washed in a washing machine and put in the dryer as well. If you’re in the market for a smaller sized dog bed that is incredibly affordable, this is one model to take into consideration. The S-Lifeeling Pet Cushion Bed is made out of high-quality materials that are designed to last as well as a variety of comfortable features. There are six different bed designs that you can choose from, depending on the personality of your cat. The bed features 15.8” of sleeping space and is covered in a soft faux fur with a comfortable foam core. They are also incredibly easy to keep clean as you can remove the cover and throw it in the washing machine and dryer. If you’re looking for a dog bed that will look modern and beautiful in any room in your home, this is one of our favorite ones. 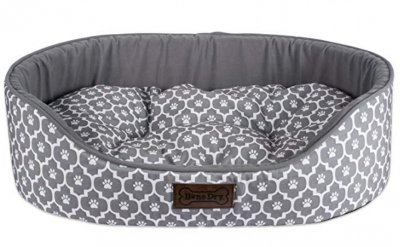 The Bone Dry Lattice Pet Bed is available in grey or navy blue with a beautiful lattice design on the cover. 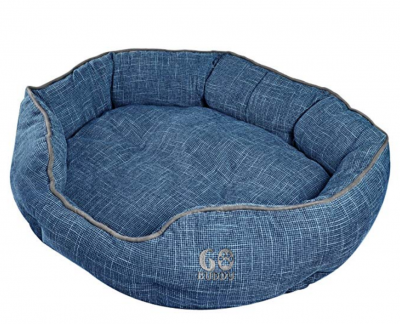 Similar to the other beds on this list, this model is recommended for small to medium dogs. The high-quality cover is crafted from Oxford fabric and the fill is premium polyester fiber. It is entirely machine washable in cold water. The premium polyester helps to add more comfort as well as healthy support for your dogs while they are sleeping. There are also elevated sides to help eliminate drafts and give your dogs extra cushioning for their heads. 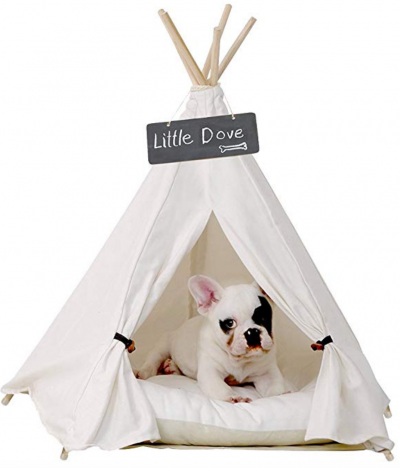 Pet teepees have become increasingly popular amongst pet owners, and for good reason. They give your pets a comfortable place to call their own and this particular design features a dog bed. This will give them their own space to rest and relax meanwhile remaining comfortable throughout the day and night. The teepee is made out of 100% cotton canvas with pine poles. The cushion cover is also made out of cotton canvas for added durability. Compared to the other beds on this list, you’ll find that it doesn’t offer as much support. However, if you’re looking for a pet bed that your dogs will love and that will look great in your home, this is our favorite option. 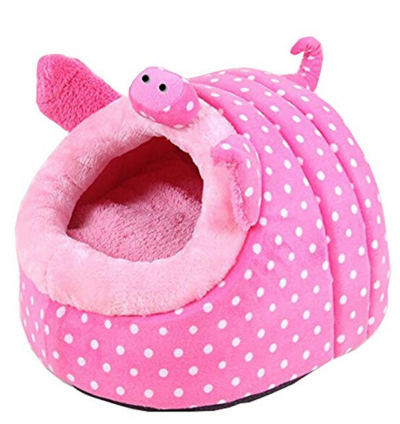 Perfect for comical families, the Winterworm Cute Cartoon Pet Bed is available in over 9 different characters ranging from pigs to fish. The main purpose of this dog bed is to provide optimal warmth. It gives your pets a place to snuggle inside of their very own cocoon meanwhile maintaining their safety with more than enough breathing room. 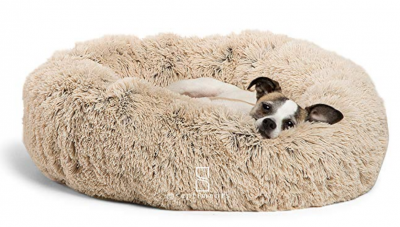 The inside cushion of the Winterworm Cute Cartoon Pet Bed is the most notable as it is incredibly plush, durable, and sure to be comfortable. 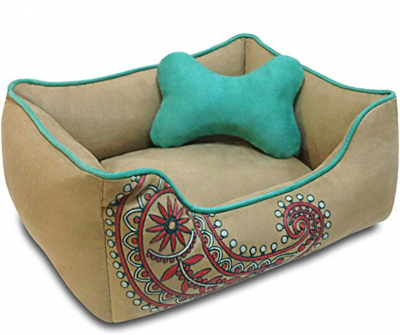 The entire design revolves around giving your dogs a cozy and comfortable place to rest. The GOBUDDY Round Pet Bed has some of the best features out of all of the other pet beds on this list. Not only is it soft and comfortable, but it also has a removable and reversible linen cushion. Additionally, it is available in small, medium, and large, which makes it easy for relatively every dog breed. You can also choose from three different colors including beige, blue, and grey. The cushion is designed using absorbent yet light linen that prevents your pets from overheating during the warmer months. You’ll also find that the material offers insulation during the winter to help keep them warm. The bed base is raised so that your pets have a comfortable headrest and the cushion is incredibly comfortable. You’ll also appreciate how it’s reversible, so if your pet stains it over the years, you can easily flip the cushion. However, we have found that the material is easy to spot clean. The Best Friends by Sheri Luxury Shag Fur Donut Cuddler offers an ample amount of luxury but for an affordable price. The main premise behind this bed is to give your dog better sleep. It has a round shape, which is perfect for dogs who curl while sleeping. There is also a raised rim to help give them a sense of security, meanwhile, offering neck and head support. 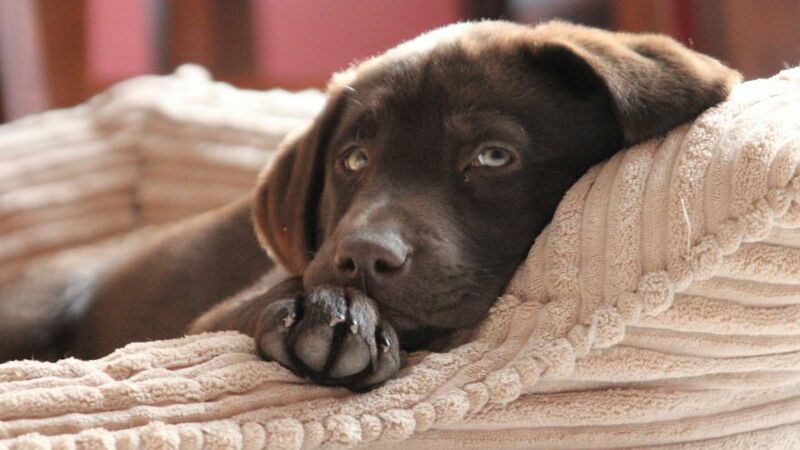 Your pets will also love the high-quality super-soft filling that helps to soothe their muscles after a long day. The cover of the bed is made out of a faux shag fur that is entirely self-warming. There are also deep crevices that your dogs can burrow into without compromising the integrity of the bed. The bottoms of the beds are also designed to be water and dirt-resistant, which makes it much easier to keep it clean over the years. 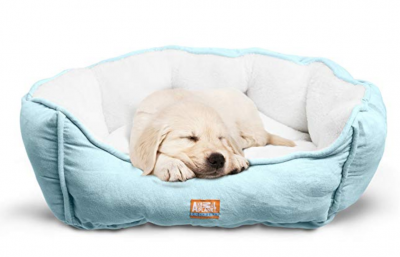 At first glance, the Animal Planet Cuddly Pet Bed looks relatively simple but it is one of the most comfortable beds that we have found. It offers optimal support meanwhile giving your pets the comfort they expect from their favorite bed. The cover is built using microsuede for an ample amount of plushness and softness. Additionally, the cushion features quilted fabric, which only adds to the plush feeling of the inner pad. Your dog will love the microsuede supplements as well as the Sherpa fur on the inside of the bed that will be gentle against the sensitive areas of their body. We also love the bolstered sides, which helps the bed to maintain its shape as your dog rests their head. It also helps to provide an optimal level of support for any part of their body. If you’re the owner of a dog that tends to get rough with their belongings, this heavy-duty bed is your best option. It has plenty of tough features specifically designed to withstand even the strongest of dogs. The overall design is rather sophisticated as it has a cover that can easily be removed and is made of scratching-resistant microsuede. Additionally, the fill is 100% eco-friendly microfiber that can also be recycled. You’ll also appreciate the double YKK zippers that are simple to unzip when it’s time to wash the cover.